Just because your vision has changed doesn't mean you have to wear reading glasses. Ray Bans are back for Summer!! Eyewish glasses are all about being seen as much as seeing well. Our Fashion Forward staff will help you select frames that are right for you. Unlike frames sold on the internet our frames are this years models not overstocked unsold product and are provided defect free and with full warranty. How to get the kids to wear them and how to get them to stay put! For some kids it's a real struggle to get them to wear the glasses. It's often harder if the kid only needs correction for one eye. The doctor recommends full-time wear and the child doesn't want to wear them at all. We do have some suggestions: Let the child participate in choosing the style, listen to what they like and dislike about the glasses. Compliment them on how great the glasses look. If it's possible have some of their peers compliment them. Suggest wearing the glasses for video game play, art projects and watching tv or movies. Encourage your child to wear the glasses full-time in the classroom and enlist the help of the teacher. 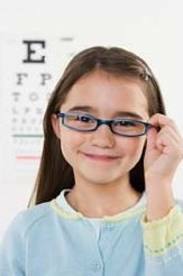 Test your child's vision with the glasses on and off at home, try to show them that both eyes do indeed see better with the glasses. To help the glasses stay on we recommend glasses with comfort cables, using a sport strap or glasses such as Liberty's Rec Specs which are designed to stay on while playing sports. Good luck! Most kids do wear the glasses more and more with time. 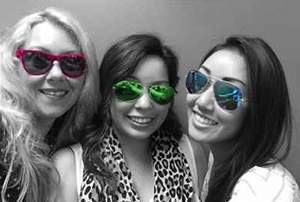 New Eyewear designers at EyeWish Optomery! Shana, our office manager, attended a national meeting in Hoston this April and was wowed by two new lines of eyewear, Fysh and Kliik. Fysh is from Urban Kool Eyewear and is inspired by the beauty and freedom of the sea. The frames have fun and funky styling, creative texture and wild colors. To get an idea of their designs follow the link to FYSHUK.com. Kliik Denmark is a line of ultra fashion eyewear for men and women who understand the connection between style and statement. To see their style follow the link KLIIK.COM .